Ty Pozzobon was a well-known bull rider throughout Canada and the United States. He was the 2016 Professional Bull Riders Canada champion and a four-time PBR world finalist, ending fourth in last year's finals. On Jan. 9, Leanne Pozzobon found her son Ty Pozzobon dead in his home in Merritt, British Columbia. A family friend was also with her. The 25-year-old had received several concussions throughout his career, to which his suicide is attributed. The Calgary Herald reported Thursday, "While he'd been suffering from the effects of a number of concussions in recent years, his family says he had been seeking medical treatment with a family doctor." Chad Besplug, of Calgary, was Ty's close friend and traveling partner; the pair qualified for their first PBR finals together. "He basically was the funnest person you could imagine to be around. I knew him for six or seven years; we texted every day. I was with him two days before he passed. We were always in contact and never had a fight," Besplug said. "He could laugh and have fun, but he was very serious about bull riding. He's the type of person you don't come by often. He was wonderful to be around, but after his concussions, some say up to a couple dozen, in the last year-and-a-half, he was starting to be different. I could see a change in him." Another friend of Ty's, Dallas Burns said he was in shock to hear of Ty's passing away. "I'm still in shock. He had the type of personality that everybody was drawn to him. He was always laughing and smiling; he always had time for everybody," Burns said. "He was Canada's version of Lane Frost. When I was a kid, I traveled with Lane, and I'm still close with his parents. I talk to them quite often, but that's who Ty was." Ty's main goal in life was to be the top bull rider, and his career was just gaining steam. "As far as being a bull rider, he worked at it everyday. He wanted to be the best. He put out the effort and worked hard at it," Burns said. "He owned bucking bulls and cows. He was raising bulls and getting connections in the PBR. He had built up quite a herd and was well on his way to produce some of the best buckers." As fellow bull riders, Besplug and Burns dealt with concussions, but neither experienced the symptoms Ty did. Besplug comes from a family of doctors, he said, and knows to nurse concussions, even if they don't hurt the next day. "It's left up to us to police ourselves and we don't always make the right decisions," Besplug said. "We have other friends that I worry about depression. I've been lucky with mine that I took time off and healed, and I've never received side effects. I may be lucky or I may have made better decisions." Burns said he could see depression easily accompanying concussions. "There are signs of depression [and suicidal thoughts], but most people aren't looking for them, especially from someone who is smiling and laughing all the time," Burns said. "Especially now with a poor economy and relationships, throw in some head injuries and you never know what can happen. No one wants to say, 'How are you? What's going on?'" Unfortunately, this is not Burns' first encounter with losing a friend to suicide. A friend committed suicide three years ago, and his brother did so last fall. "There is so much going on in everybody's lives. My brother and his wife got in huge argument," Burns said. "The doctor had given him pills to ease his anxiety; he gave him three months of pills. He took every one of them then. Do you blame the doctor? Do you blame him? We had no idea he had gone to doctor." Several of Burns' friends have reached out to him after having suicidal thoughts. He said he spoke with them openly and without reserve. "What I learn is the people who are smiling and happy, those are sometimes the ones hurting the most inside," he said. "They're always there for everybody else and making someone else happy. They're usually the ones that have the most damage." Ty was seeking care for his concussions while still keeping his career on track. "But at the same time, you don't want to lose the momentum. I don't think that in most cases, (athletes) could be 100 percent healthy or recovered from any kind of injury, whether it be a physical injury or a concussion … the question is, when do you make that call to continue with your professional athlete career?" Family friend Gail Joe told the Calgary Herald Thursday. She was with Leanne when she discovered her son. 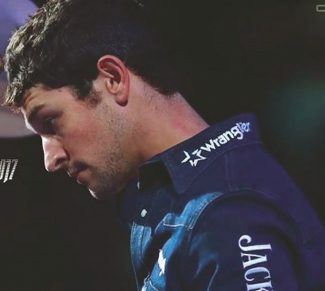 Ty's family is asking that in lieu of flowers, donations be made to Rider Relief Fund, an organization providing financial assistance to injured bull riders. Ty leaves behind his wife Jayd, parents Luke and Leanne, and sister Amy. "One thing wanting to get across is that it's time we can be tough and smart. There are a lot of factors that go into a guy pushing himself through dozens of concussions," Besplug said. "One thing to get out to kids and youth in rodeo is there's nothing tough about riding with a concussion. There are a lot of times to be tough in rodeo, maybe riding with a broken hand or broken ribs; that's tough. Riding with a concussion isn't tough. We want to start this conversation. If something doesn't change, this won't be the last time."